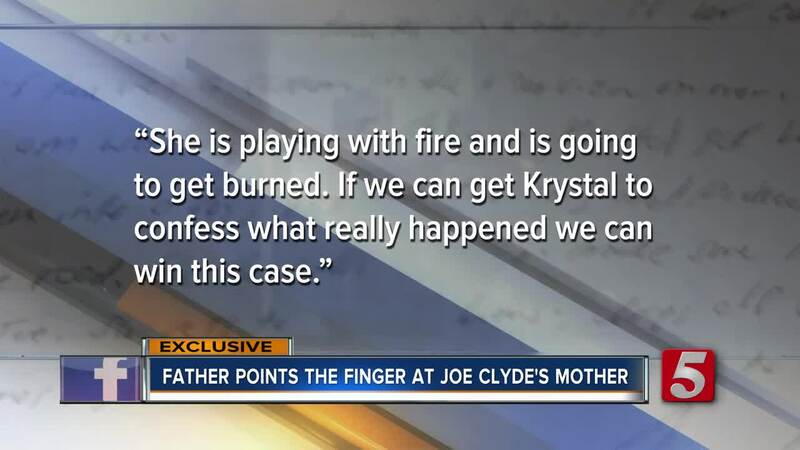 Letter from Joe Clyde's Father: "If we can get Krystal to confess...we can win this case." 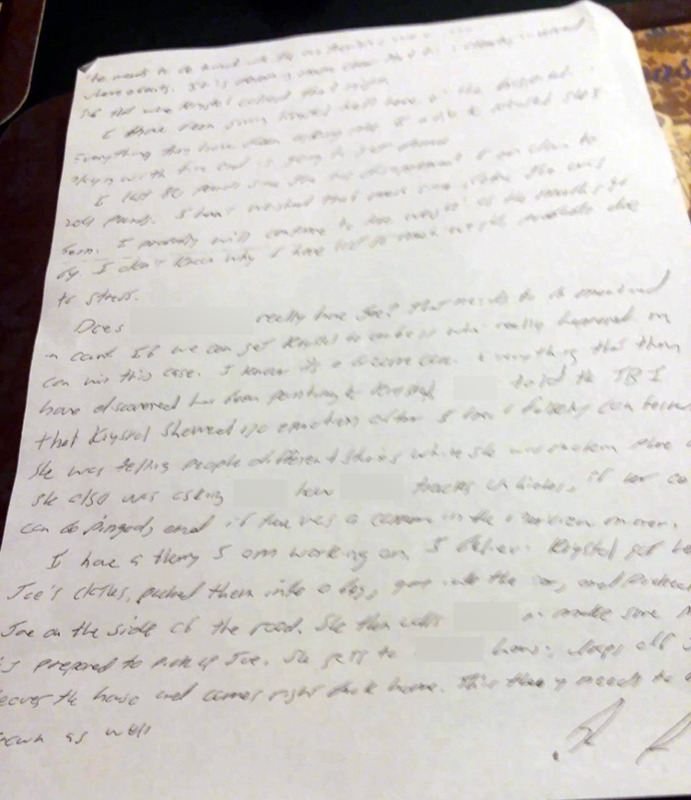 NewsChannel 5 has obtained the letter sent from the father of Joe Clyde Daniels last week to his parents. In the letter , Joseph Ray Daniels writes to his parents about his health, as well as a theory as to what happened to his son. The letter is handwritten, addressed to Daniels' parents home, and signed at the end by Daniels. The letter begins by saying another person was involved in the disappearance , along with Joe Clyde's mother, Krystal . "She's playing with fire and is going to get burned," Daniels wrote. Photograph of the letter sent by Joseph Ray Daniels to his parents. 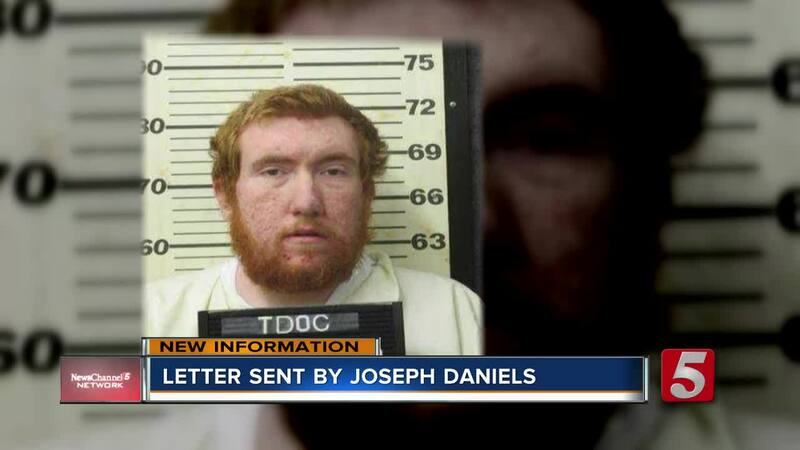 Earlier this year, investigators said Joseph Daniels confessed to killing his son. However, his attorney argues the confession was coerced. To this day, investigators said Joseph Daniels has not been able to tell them what happened to his son's remains. "I lost 80 pounds since Joe has disappeared and I am down to 204 pounds," Daniels continued. "I don't know why I have lost so much weight. Probably due to stress." Daniels then goes into a theory about what he believes may have happened. "If we can get Krystal to confess what really happened we can win this case," he writes. Krystal was charged with criminal responsibility, aggravated child neglect and filing a false report. Joseph Ray was charged with homicide. Legal expert Jim Todd thinks he's pointing the finger at his wife, but says "it's hard to argue this defense when you've confessed to killing." "I know this is a bizarre case. Everything that they have discovered points to Krystal," Joseph writes. He adds that someone told the TBI Krystal showed no emotion after Daniels "falsely confessed," and was asking that same person if her car could be tracked. The letter continues to detail Daniels theory that Krystal packed Joe's clothes into a bag, got into a car, and left Joe on the side of the road, calling someone else to make sure they're "prepared to pick up Joe." The theory continues that Krystal then drove to the person's house mentioned at the beginning of the letter to drop off an item, then immediately returns home. Authorities have seemed to discount the letter and have said it won't alter the investigation. "If he sent the letter and it's self-serving the letter will not see the light of the courtroom," said Todd. Joseph Ray and Krystal Daniels remain locked up on $1 million bond each. Both have have pleaded not guilty. They are scheduled to go to trial early next year.